I came to your facility in March of 2010. I remember arriving there, in the midst of my addiction, wondering if this method would really work and what I would be in store for days, months and even years after. I was depressed, underweight, unhealthy, and worst of all, addicted to Methadone. It has been almost 6 years and I can’t begin to tell you how different my life is now and how differently it might have turned out had I not gotten clean and sober. I want to thank the entire RDD staff for their compassion, support and most of all, giving me the life I deserve. 5 years ago, I met the love of my life and his then 7 year old daughter. 2 years later, we added to our family with the birth of our daughter. I also have a job that I love and this year we are purchasing our very own home. I have the support, trust and respect from my family and friends that I otherwise would have lost completely. All of these things I would not have if it were not for the RDD facility and more importantly, the staff. I am eternally grateful for the life I have, that you gave back to me. 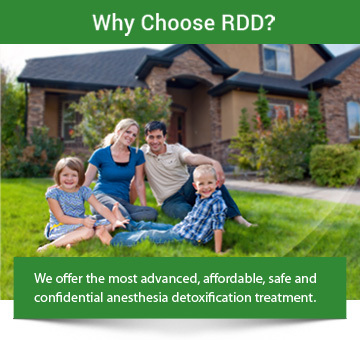 I have told so many people about the wonderful experience and the excellent care I received at RDD. I urge anyone who is struggling with opiate addiction to contact RDD. If you’re feeling hopeless and trapped, and are tired of your life revolving around drugs, all it takes is 1 phone call to turn it all around. I would be happy to speak to anyone who is having doubts about going to RDD. This place saved my life and it will save yours too, I guarantee it. Thanks again RDD, you really are an exceptional group of people.